Calling all Brides-to-Be! 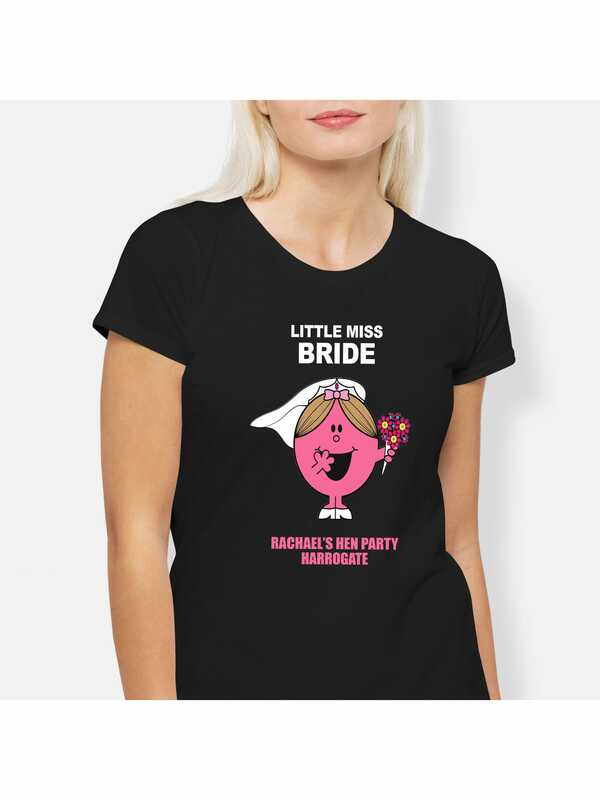 For a cute and innocent hen party top, choose this 'Little Miss Bride' design. The design is complete with a cute, blushing, Mr. Men style bride cartoon image, complete with a veil and bouquet! You can choose either a vest top or t-shirt, in pink, black, or white. Simply place your order and we will get it shipped to your address of choice. Showing our 4 Hen Party Superstore Little Miss Bride Hen Party T-Shirts reviews with an average rating of Excellent. Would you like to write a review? Review - I bought this lovely tshirt in hot pink for my hen do and wore it on the first day as I travelled to meet my hens :) all my hens loved it as it was such a cute alternative to the logo tshirts you can buy! it was good quality and has been fine in the washing machine. Great value! I bought this lovely tshirt in hot pink for my hen do and wore it on the first day as I travelled to meet my hens :) all my hens loved it as it was such a cute alternative to the logo tshirts you can buy! it was good quality and has been fine in the washing machine. Great value!